For the first time since 2012, a short position >0.5% ("big short") has appeared in London Stock Exchange Group (LSE). It is a 0.5% short by Merian Global Investors and has been placed on 2018-12-07. At LSE's market cap of about £13.68b, the corresponding short value is about £68m. Interestingly, Merian recently also shorted Deutsche Boerse AG. They are holding a 0.5% short since 25th of October. At a market cap of about €21.06b, this corresponds to a short value of about €105m. Short bets against major exchanges are very rare in our records. Merian's short is the first ever big short in Deutsche Boerse in our records, that go back to 2012. LSE was shorted back in 2012 by BlackRock Institutional Trust Company, N.A. and GLG Partners LP, but these short positions were cut in Nov-Dec'12. Since then, no new short positions in LSE were disclosed until this Merian's short. Merian is currently one of the most active short sellers in our UK and EU records and is in Top 5 when it comes to the number of big shorts in both our EU and UK list. 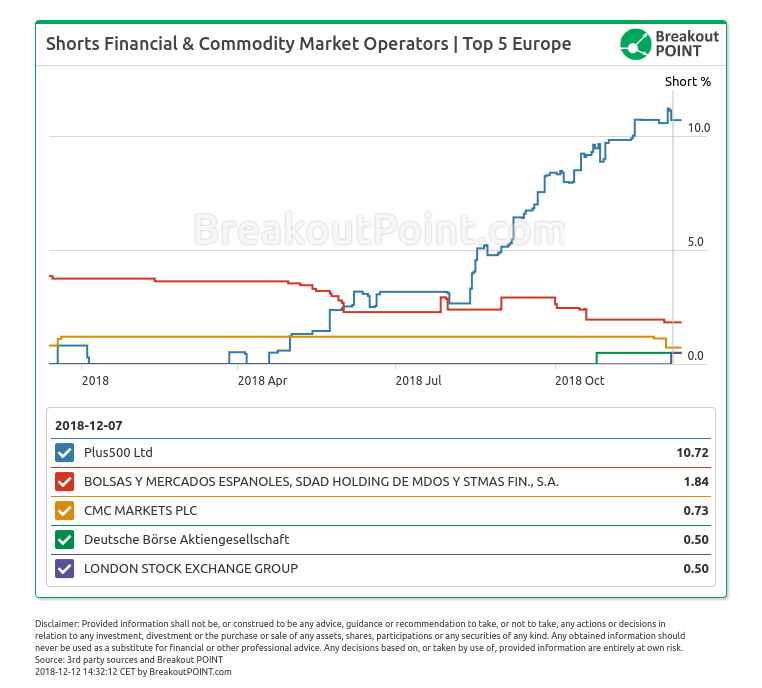 Below is recent development of the big shorts in EU's Financial and Commodity Market Operators sector, aggregated over all short position holders.